Before I get started with my review of Rules by Cynthia Lord, I want to take a minute to introduce you to my son, Finley. Finley is five years old, and he is loving, pure, and sweet. He loves dolphins and does the best imitation of them I have ever heard. He has watched Trolls at least 80 times and Moana twice as many, and he’s surprisingly good on harmonica and drums. He loves music (especially Lady Gaga and Daft Punk), is extremely ticklish under his chin, and thinks his older brother hung the moon. Finley is also nonverbal and was diagnosed with autism exactly one month before his second birthday. 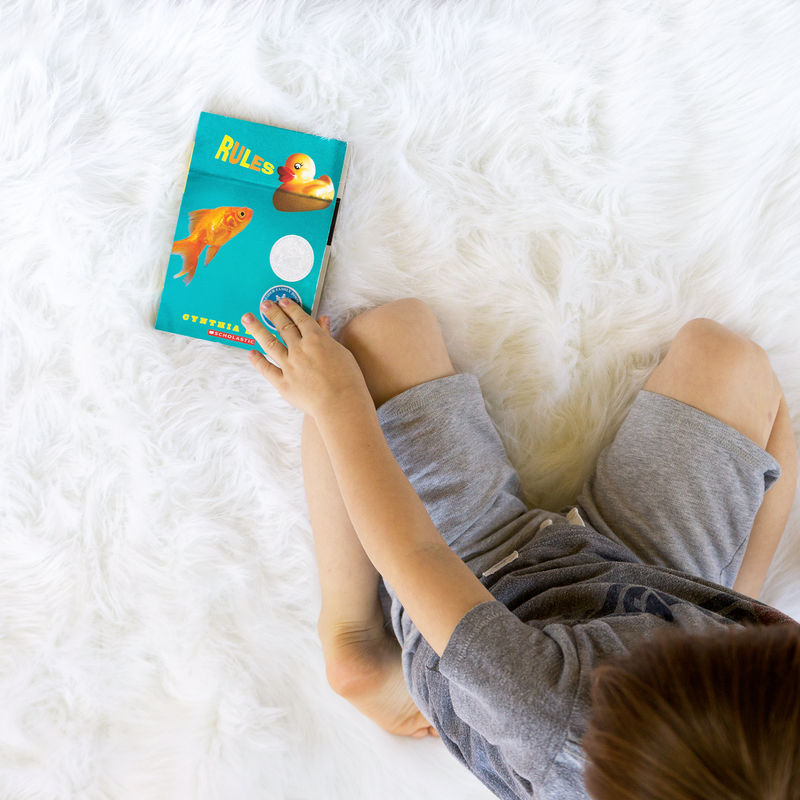 I wanted to introduce you to my son, Finley, because I want you to understand why books like Rules are so incredibly important. Rules is told from the perspective of twelve-year-old Catherine. Her younger brother, David, has autism, and to help him function in the world–and keep him from embarrassing her–Catherine has created a set of rules for him to follow, like “Keep your pants on! Unless Mom, Dad, or the doctor tells you to take them off,” and “Sometimes people laugh when they like you. But sometimes they laugh to hurt you.” Although Catherine loves David, she has a hard time learning to accept him the way he is and frequently wishes his autism would disappear. While taking him to therapy with her mother, Catherine begins a friendship with a nonverbal boy her age in a wheelchair named Jason, but she experiences conflicted emotions about their friendship after meeting the new next-door neighbor she desperately hopes will be her friend, Kristi. Catherine struggles to navigate a world where people aren’t always nice, parents don’t always know how to divide their attention between two kids, and friendships are not always simple to explain. Although I am not normally drawn to middle grades (and younger) fiction, when Madeleine from Top Shelf Text suggested this book, I knew I had to read it. All the books Madeleine has recommended have been incredible, and she sent this title my way specifically because of the autism element to the story. Here’s what I have come to expect from middle grades fiction: heartwarming stories, lovable characters, and poignant lessons. 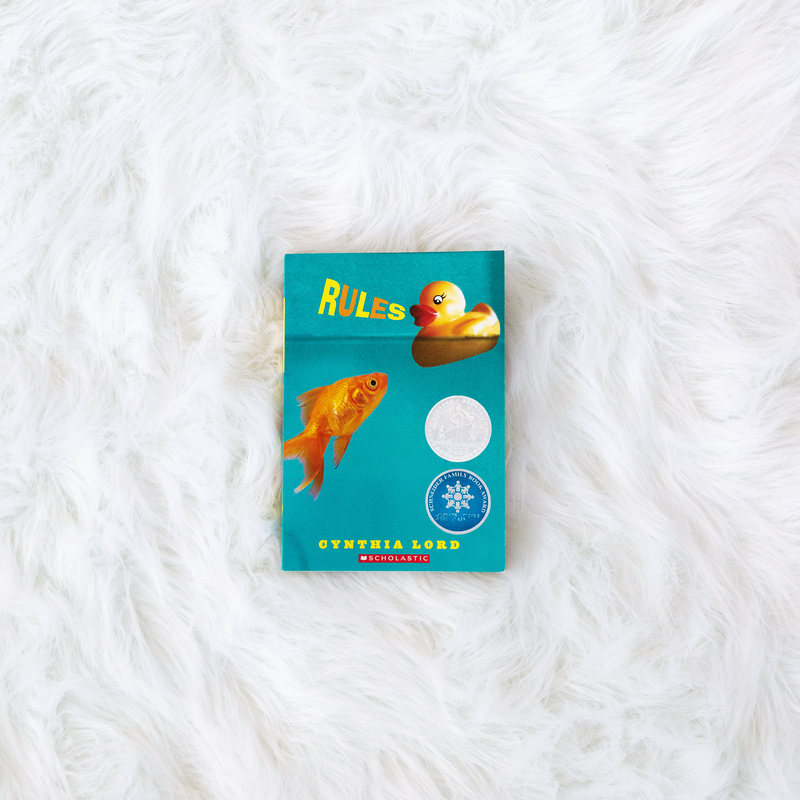 Here’s what I was NOT expecting, when I read Rules: having to stop, multiple times, to allow myself time to recover emotionally before picking the book back up to read more. This book is incredible and important for everyone to read, not just kids. Not only does it teach especially important lessons about accepting those with special needs, but it also helps readers understand the reality of the difficulties those people experience. I loved Catherine’s interactions with Jason, especially, because they show the frustration of being nonverbal and demonstrate that Jason is ultimately a regular kid. He fights with his mom, loves music, wants to experience all the same things other kids his age experience, and gets annoyed that his speech therapist seems to confuse being nonverbal with being hearing impaired. As Catherine begins to understand and appreciate her friendship with Jason, she learns incredible lessons about acceptance and pride. However, this book was also very tough for me to read, at times. The peek inside the mind of an older sibling of a child with autism was something I needed to read, but that doesn’t mean it was easy. With every moment that Catherine felt her mother prioritized David’s needs over hers, I wondered if Finley’s brother, Gavin, ever feels that way. When Catherine experienced jealousy over the time that her father spends with David, I immediately questioned whether my own attention is divided equally between my boys. When Catherine was mortified by David’s behaviors, my heart hurt. It was a full day before I could pick this book back up after reading that line. That, ultimately, is my only complaint about Rules. I adored this book, the lessons it taught, and the characters it brought to life. However, throughout the book, Catherine reiterates that she wishes her brother didn’t have autism. She says, “I look down between the raft boards and imagine my always-wish, my fingers reaching through the perfect top of David’s head, finding the broken places in his brain, turning knobs or flipping switches. All his autism wiped clean.” Her repeated claim that David is somehow broken was so incredibly hard for me to read. And at the end of the book, I never really felt like she comes to the realization that David is not broken at all. That, ultimately, is what I felt Rules should have been about–Catherine’s journey to understanding that her brother’s autism is something to embrace and love, not constantly try to wish away. Without that lesson, Rules felt incomplete to me. Kids with autism aren’t broken. They are different, for sure, but they are still perfectly perfect, in their own ways. Posted in UncategorizedTagged book review, books about autism, cynthia lord, Fiction, fiction review, middle grades fiction, rulesBookmark the permalink.